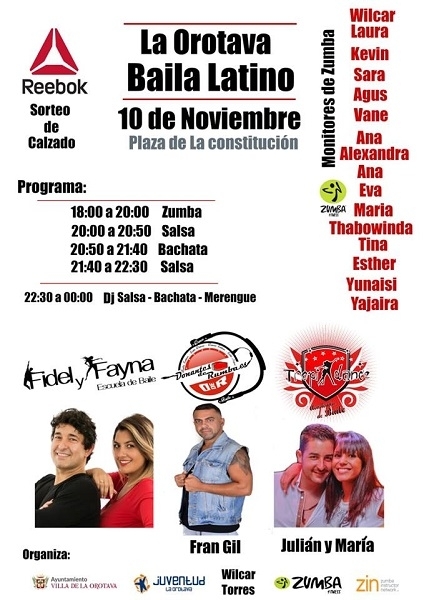 On Saturday, there will be dancing in the Plaza de la Constitución in La Orotava to all the rhythms that Latin American music has to offer. From 6pm to 8pm, Zumba trainers will show how to move your body perfectly between fitness and dance to Salsa, Merengue, Cumbia, Reggaeton and Zumba. The session will be led by Wilcar Torres. 09.11.2018 - From 8pm onwards, three 50-minute dance sessions will be offered by professionals. The first salsa lessons feature Julián and María. Afterwards Fidel and Fayna invite you to try the Bachata and at the end Fran Gil will show you more Salsa steps to try out. The participants can then try out what they have learned together with a DJ in the plaza. The party lasts until midnight. Produced with news.CMS in 0,0866 seconds.